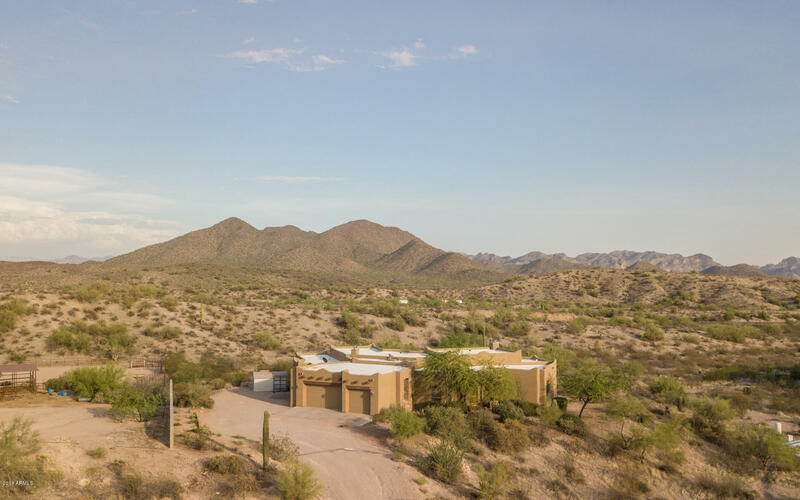 All Fort Mcdowell homes currently listed for sale in Fort Mcdowell as of 04/22/2019 are shown below. You can change the search criteria at any time by pressing the 'Change Search' button below. 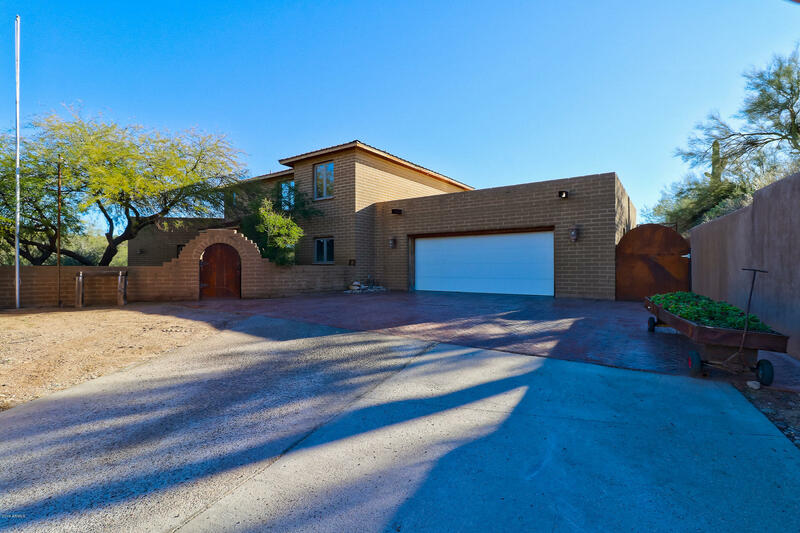 If you have any questions or you would like more information about any Fort Mcdowell homes for sale or other Fort Mcdowell real estate, please contact us and one of our knowledgeable Fort Mcdowell REALTORS® would be pleased to assist you. 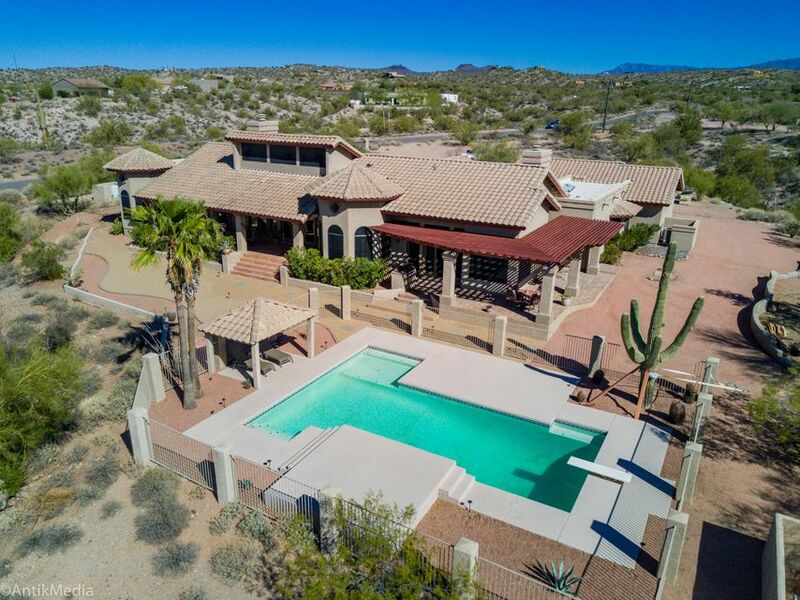 "Luxury 5-Acre Estate 35-mins from Sky Harbor. This property has everything you need for fun & easy living. Fully fenced property w/open parking for all your cars, trucks, toys & trailers. 95x240 fenced & watered arena, shaded pens w/space to roam, & swamp cooled Premiere Sips Barn (super insltn/constrctn). Barn Guest Qtrs offers full bath w/d & Great Bonus Income Potential! Horses are comfortable year-round in oversized stalls w/water, fans, & walk-outs. Tack Rm w/kitchenette, saddle racks, & e"
"This gorgeous southwest ranch-style home, with over 5 acres of surrounding land, is move-in ready! 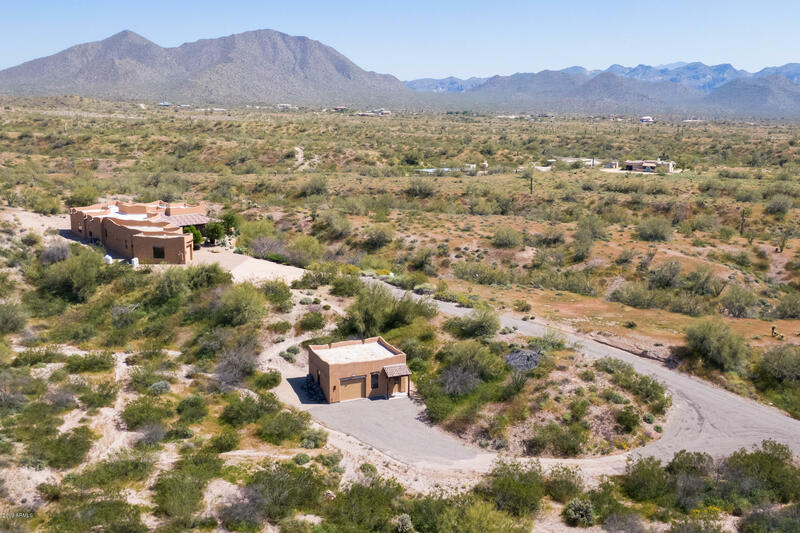 Stunning views of mountains and the Sonoran Desert complete this idyllic setting, affording the residents of Goldfield Ranch the opportunity for a rural lifestyle - while still close enough to Fountain Hills to have easy access to shopping & entertainment. Minutes off of the Beeline Hwy, the home is a custom luxury that blends perfectly with the rural ranch ambiance of the area. A detached garage w"
"$25,000 buyer allowance for upgrades on an acceptable offer.!!! 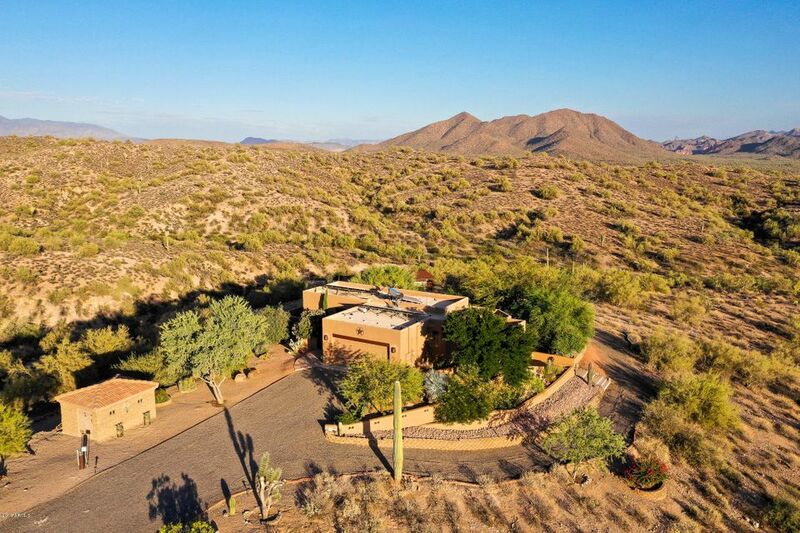 6.19 acres surrounded by beautiful mountains, and desert arroyos. This 3 bedroom ranch style home with a Spanish/Santa Barbara touch, boasts 3 large bedrooms, formal living and dining rooms, and galley eat in kitchen with granite counters and plenty of storage. Cozy family room with beehive fireplace, with breakfast bar to the kitchen. Surrounded by open and covered patios with 180' views. Built in BBq off the kitchen, gated divin"
"Nine acres surround this Southwestern ranch inspired home. The views are endless and encompass the four peaks. This welcoming open floor plan delivers an engaging great room concept, with wood beam ceilings, Saltillo tile floors and traditional wood stove. The kitchen has beautiful views from the kitchen sink and showcases granite counter-tops, custom cabinets, high-end Bosch appliances, a breakfast bar, and a large walk-in pantry. The laundry room comes with LG stack able washer and dryer, al"
"Custom Adobe home on a serene and private hillside setting with extra garage or horse facility on 4.75 acres in Goldfield Ranch. Enter and entertain your guest with mountain views in the serene courtyard area. As you enter, you'll find beautiful flagstone floors, complimented by tongue-and-groove hickory hardwood floors and solid core doors throughout. The kitchen features stainless appliances, granite counter tops, custom hickory cabinets and large custom wood beams, which opens to the great "
"Custom home on 4.45 acres. Spectacular mountain views! Stone floors, granite counters, custom alder cabinets, 2 stacked stone fireplaces, chefs kitchen, spacious master bedroom with sitting area and master bath jetted tub, walk in shower plus a 2-way fireplace. Entertainer's dream home; home theater with projection hide-away screen, surround sound, covered curved patio many sitting areas & wood burning pizza oven. Ride or Hike into Tonto National Forest which borders Goldfield. 10 minutes to Sag"